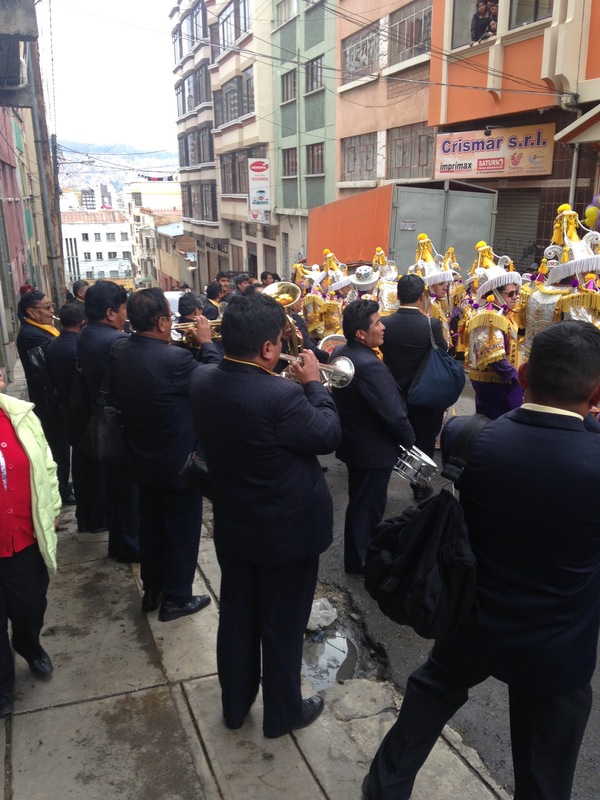 We were woken early on Sunday morning by loud banging of drums and trumpets just outside our hotel window. A little annoyed we scrambled to the window to see what was going on. The little church just next door that until now had been so peaceful, empty and tranquil, had suddenly sprung to live. All dressed up church goers with yellow banners of various sorts, marched in and out of the church playing their drums and trumpets, singing and shouting. We had become aware of a harvest festival soon to be celebrated and thought this might be it. On further inquiry at our traditional style Rosario Hotel desk, we got misleading messages about this mysterious celebration. Determined to find out, we dressed, went out and started following the parade with our kids in tow. The parade marched along the main street of the neighbourhood with the orchestra at the front until it turned to the left down a side street and entered a building there. A prominent position was taken by a white dressed couple that each was holding an effigy of a male and female. 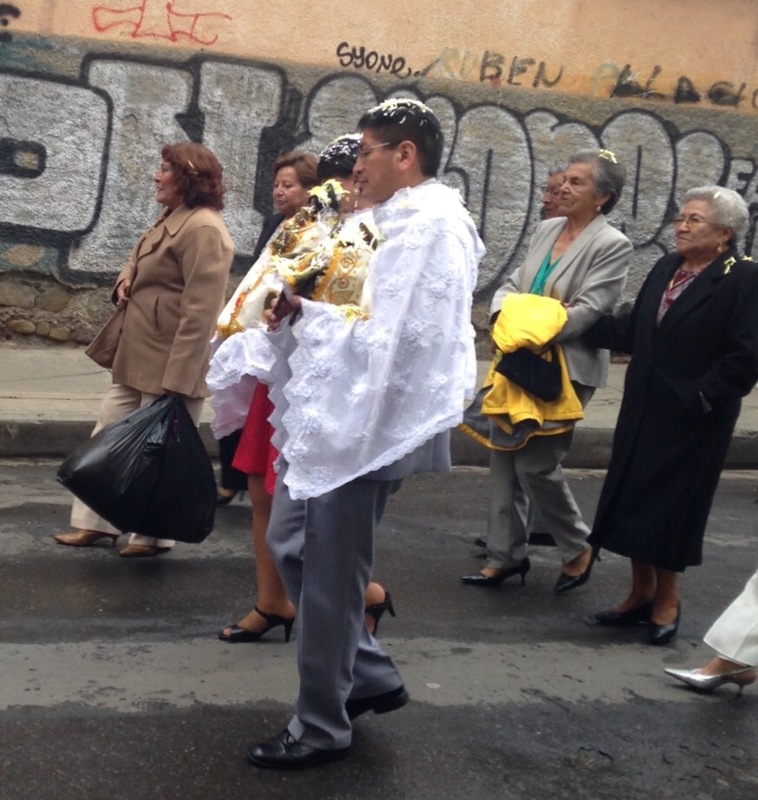 It is my suspicion that this celebration is one of the thinly disguised remnants from Bolivia’s ancient beliefs in the mother goddess Pachamama and the god of creation and the sun Viracocha. A belief system that never really was squelched by the Catholic church but lived on and has experienced a fresh revival in the last couple of years. Vorum vakin kl. 07:00 á sunnudagsmorgni við geðveikan lúðra og trumbuslátt beint fyrir utan gluggann á hótelherberginu okkar. Þar marseraði út úr kirkjunni við hliðina á hótelinu, skrúðganga gulklæddra staðarbúa veifandi grænum stönglum, hrópandi og syngjandi í takt við ærandi hljóðfærasláttinn. Höfðum heyrt af uppskeruhátíð sem væri yfirvofandi. Skildist á gæjanum í móttökunni að hátíðin héti Llamerada. Eftir morgunverð fórum við út og náðum nokkrum myndum. Hvítklædda parið hélt á líkneskjum sem voru karlkyns og kvenkyns. Skil nú betur þetta með að nútíma trúarhátíðir í Andesfjöllunum eru með þunnu yfirborðslagi kristninnar en undir niðri eru þær í raun hefðbundin trúarbrögð á þessum slóðum fyrir komu Spánverjanna. Trúin á móðurgyðjuna Pachamama og Viracocha sólarguð lifir enn góðu lífi.